Prepare to burn off the turkey, and live out those ‘Star Wars’ phazer battles for real! 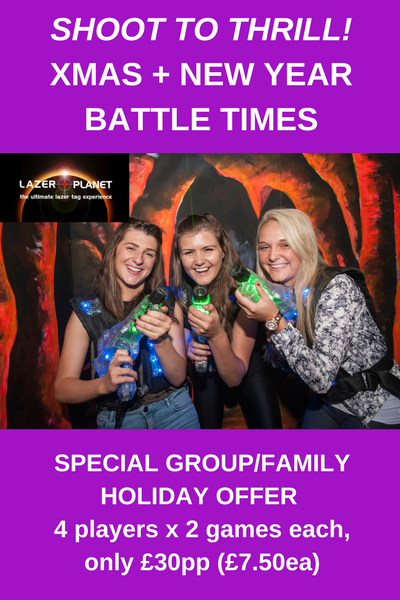 Challenge friends and family to a thrilling sci-fi laser tag adventure at Lazer Planet over the holidays. Have a blast playing team and solo games in the huge multi-level arena full of pulsating lights, smoke, and throbbing music – it’s like being in a movie. Games start every 20 minutes, and are only £5.50pp. BEST VALUE – Get a group of friends and family together, and pay only £30 for 4 of you to play 2 games each (£44 value). Extra players are only £7.50 each. Simply quote the ‘holiday offer’ when booking. Don’t forget, the fun does not stop there, as Lazer Planet is housed inside ScotKart Indoor Kart Racing in Clydebank. The track is open the same hours as Lazer Planet for kids (age 8+) and adult karting, plus family sessions, right over the holidays. Easy access by train to Yoker station, bus stop on Dumbarton Rd, or by car from Glasgow, Paisley and central scotland. Book now on 0141 641 0222 (min age 6). T&C Offer subject to availability and cannot be combined with any other offer. Applies to pre – bookings only, ends January 7th 2018.